Robamimi once again presents a single-walled escape that proves you don't need a large space to be treated to a roomful of fun. Although the view is limited, that doesn't mean there isn't plenty to explore; a wide gamut of puzzles and amusing sights are strewn in almost every pixel of this charming scene. Gameplay is simple: point and click to zoom in and out, examining objects and deciphering codes until you've opened every lock. Robamimi's typical user-friendly interface makes navigation easy so you can sink all your mental powers into finding your way out the door. While a few answers will be staring you straight in the face, you'll also be expected to infer some solutions based on a number of rather vague clues. The HINT button will give you just that: another hint to throw into the mix of information while still leaving the credit for solving the puzzles squarely on your shoulders alone. Here is everything good about Robamimi rolled into one very entertaining escape. One Scene 6 Walkthrough now available! Since One Scene 6 is semi-nonlinear, and almost everything you see can be examined and/or used as a clue, this walkthrough is organized according to Robamimi's in-game hint system. If you're stuck somewhere, click the "HINT" button then reference that part of the walkthrough for more help. Click on the large window in the middle of the room to get a better view. Note the numbers in four squares on the corner of the truck's tarp. Back up from the window and zoom in on the two-drawer chest on the left side of the room. Four square buttons are arranged exactly like the squares on the tarp. TOP LEFT, TOP RIGHT, TOP RIGHT, BOTTOM LEFT, TOP LEFT, BOTTOM RIGHT, BOTTOM LEFT, BOTTOM RIGHT. Take from the bottom drawer a pair of CANDLE STRIPE. Note the location of each black tile as you scan from right to left. Now zoom in on the two-drawer chest to the right of the table. Three buttons are stacked in a column. Take out the CANDLE WHITE. There's 1 utensil in the steel cylinder, 3 in the glass, and 2 in the grid container. On the glass door is the number 8. By the menu on the table is a steel cylinder: look inside for the number 2. A grid-patterned trivet on the corner of the table shows another number: 7. Examine the bottom drawer of the chest near the door and enter the correct 3-digit number. There's a sign taped to the window on the left side of the room: "ROLLCAKE." Note the arrow at the swirling pattern. There's pictures of three different rollcakes...pay special attention to the direction of their roll as well as the pattern on their plates! Along the right edge of the menu are a series of lines, dots and dashes. It has three dials: the outer is a solid line, middle dial is dashes and inner dial is dots. To the right of the dial are buttons that control each dial; clicking a button in the "L" column will turn the corresponding dial to the left, "R" turns it to the right. Turn each dial to the correct setting and click "ENTER" to unlock the safe. This one is easy to overthink, but the answer is actually strait-forward as soon as you take in EVERY clue. Here's a unique little puzzle because the answer is determined by what YOU do. Thus, everyone's answer will be different! Now that you have the SCISSORS, examine each pair of CANDLES in your inventory and cut their wicks, leaving you with six individual CANDLES. Place each of the six candles on a sconce; you can set your candles in any order. Whatever order you set your candles will be the order in which you have to click the patterned buttons on the left chest. Candle Holder I (left): go from left to right. Candle Holder II (right): go from right to left. Examine the chest on the left side of the room and zoom in on its top drawer. Click the patterned buttons—white, striped and black—in the correct sequence. The answer is however you set the candles: first click the patterns that correspond to the left holder's candles, reading from left to right; then click the corresponding patterns from the right holder's candles, this time reading from right to left. When you've clicked each button twice in the correct sequence, click "enter" to open the drawer. get a KEY with a yellow fob. "How Many Steps [to] the Goal?" Use the yellow KEY to unlock the panel in the table top. Four differently colored game pieces are at various spots along the game. Make a note of what you see. Note the different colors of the word: "GOAL". Press the big red button! Then, wait to see what happens. A circle is above the candles on the left; a triangle above those on the right. If this action is going to be of any use, you first need to solve the "GOAL" code on the wallbox. That done, when you look out the window, you'll see a new sign outside the fortune teller's. Make a note of all the information it displays. Back up from the window and zoom in on the chair on the right side of the table. Examine the two-button "candle" box. Press the left and right buttons in the correct sequence. A KEY with a blue fob. 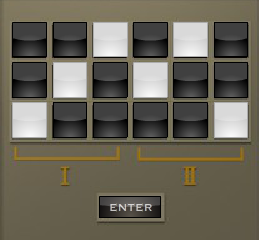 Here you see a 3x6 grid of buttons, divided into two sets: I and II. Ignoring their colors, make a note of the height of each candle. Return to the wallbox by the door and, using the clue from the burnt-out candles, light up either the lowest, highest or middle button in each column. When you've entered the correct pattern on the grid, click "enter" and the door latch is withdrawn. Close the box, back up, then click on the door to escape! Your own choices will define one of the codes. I'm not quite at that point, but I was wondering if that was going to be the case. I'ma bit stumped at this point, but enjoying myself as always with a Robamimi game. the Roll Cake puzzle and the safe. The lines on the safe's dials, the lines on the side of the menu, the direction of the roll cakes, and...the lines on the roll cakes' plates. That should tell you all you need to know! Also Dave, don't over think it. I was guilty of that for a couple of these puzzles! ignore the color, concentrate on size! That one was a lot of fun! Not too hard, either, aside from a tricky spot or two, both passed through the hints. Now I want to try a rollcake. ID check error, 100% loaded, and you can not play the game. You will experience this if using Windows 8.1 with Internet Explorer 11. To fix this, run IE11 in Compatibility mode. Click on tools (gear icon) and select Compatibility View settings and Add the website (robamimi.biz) to the box list. If you us InPrivate Browsing, the compatibility setting will be deleted when you close IE11. Aside from that everything else flowed beautifully and logically. Really enjoyed this one! Easy enough to do in a short amount of time, but not so easy that it wasn't worth it. Had to think, but had all the info I needed close by. Nice! And really like the HINT feature in these games...sometimes that is all you really want. Addendum to my last comment: I looked up rollcakes on Google. Apparently, that's another name for Swiss rolls. This was a REALLY nice game. I love that everything is in "one scene" and the puzzles are logical. Even if I took some time to figure stuff out, it's all there for the solving and very methodological in a way.